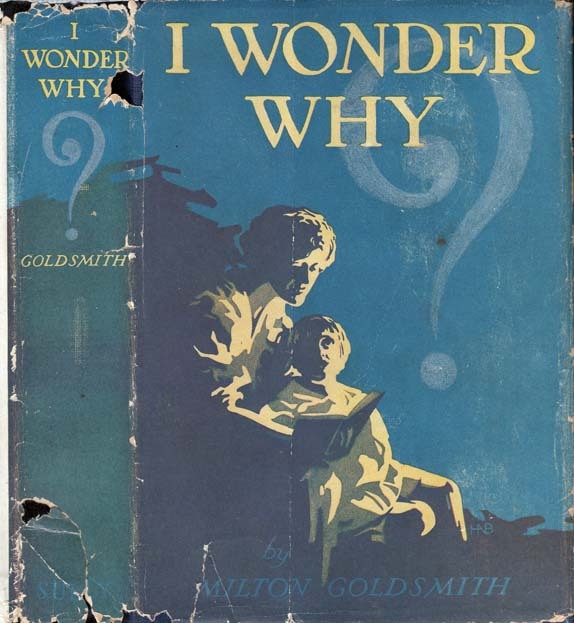 My father remembers Milton Goldsmith as an author of children’s books so I was not surprised to learn that Milton had in fact written a number of works for children after moving to New York City in about 1905. In 1905, Milton, Sophie, and their two young daughters were living at 1125 Madison Avenue in New York City, but Milton was still working as a merchant, according to the 1905 New York State census. 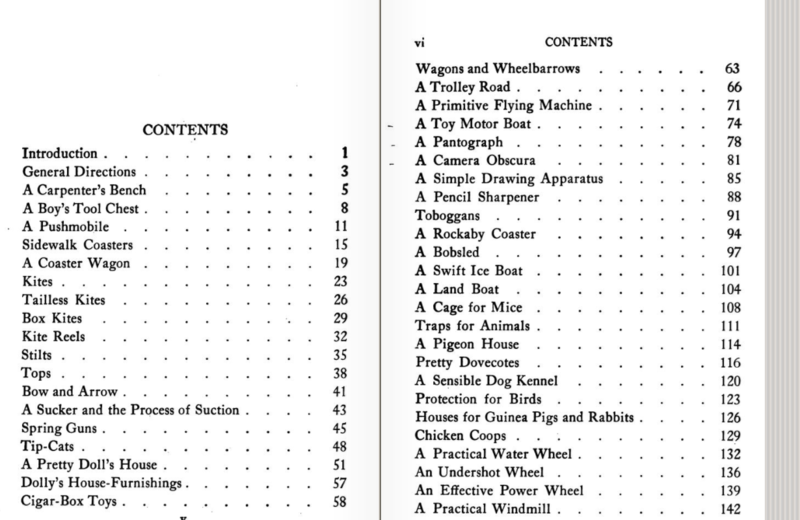 However, by 1906, Milton was listed in Who’s Who in America as an art publisher and author.1 The listing stated that he was the president of Goldsmith-Leving Company, a company engaged in the embossing of art, calendars, pictures, and the like. It further described him as a contributor of many short stories to magazines and local and Jewish newspapers and of “several hundred poems” to magazines such as Puck, Judge, Life, and Cosmopolitan. 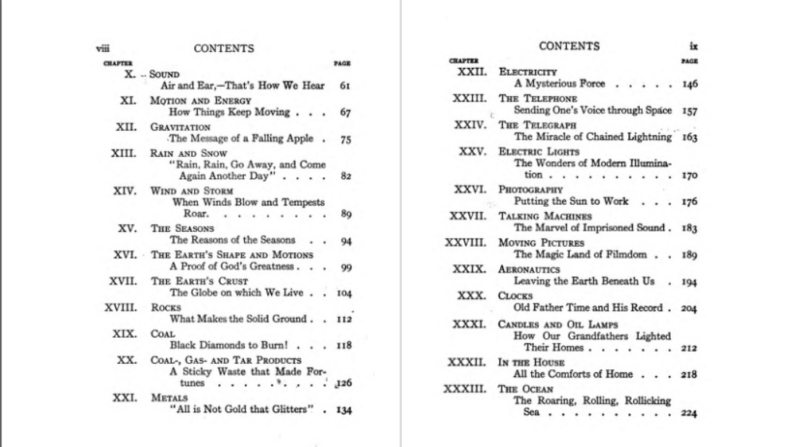 In addition, Milton’s musical and dramatic works were mentioned in the listing and, of course, his books. 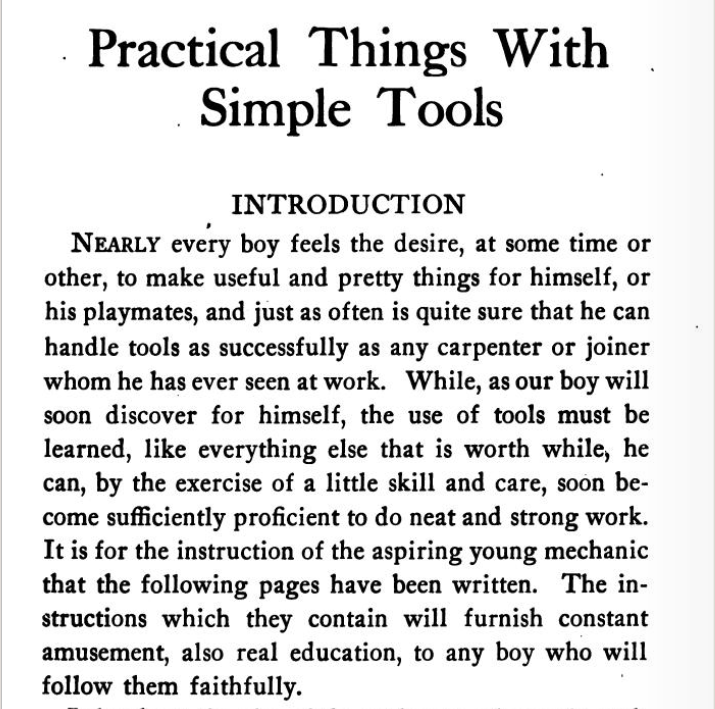 In 1908 Milton published his first children’s books. So far I have found three of them published in that year alone. The Adventure of Walter and The Rabbits,2 is a story about a boy named Walter who follows a rabbit into a hole in a tree and observes the rabbit family; he learns never to be cruel to animals based on his observations. It is a sweet story and one with a lesson all children should learn. Its innocence and simplicity seem quite refreshing in contrast with some of the cloying Berenstain Bear books I’ve lately had to read to my three year old grandson. I assume that Milton wrote this book with his two young daughters in mind. 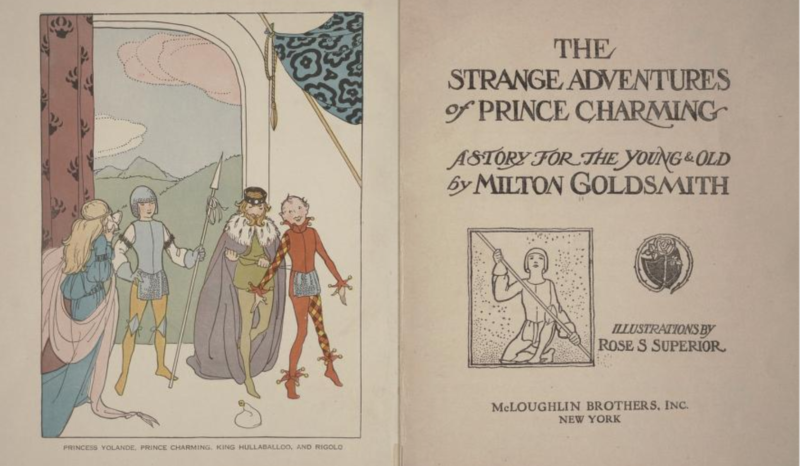 I was unable to locate online versions of the other two children’s books published by Milton Goldsmith in 1908; I wish that I could spend the money to buy copies of all his works, but alas, that is not feasible. But I was able to find images of the covers of the books online. I imagine that Milton’s two young daughters Rosalind and Madeleine were the inspiration for all three books. From this point forward in his writing career, almost all his books were written for an audience of children. By 1910, Milton seems to have left the art embossing business and gone into advertising, for that is the occupation listed for him on the 1910 census. At that time he and Sophie were living at 783 Madison Avenue with Sophie’s mother and her two sisters as well as her sisters’ husbands. I was puzzled that neither of Milton and Sophie’s daughters was listed in the household; Rosalind would have been nine, Madeleine six. Where could they have been? Since I could not find them anywhere else on the 1910 census, I believe that this was just an enumeration mistake. 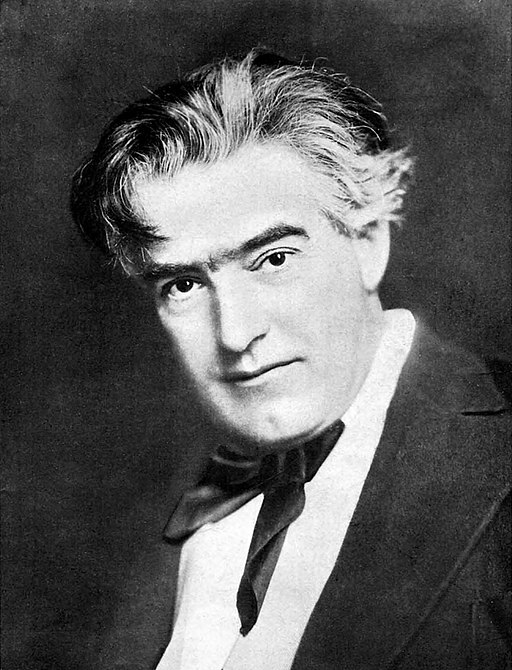 According to one source, Milton spent 1910 and 1911 in Berlin and Paris, translating German and French plays into English for the American stage. By 1915, they were all listed together (though Rosalind was here listed as Ralph and as a son), living at 353 West 85th Street in New York, and Milton continued to work in advertising, now at his own agency. It’s hard to imagine the same author who expressed quite modern views of religion and skepticism about superstition in A Victim of Conscience and Rabbi and Priest endorsing these practices, but perhaps that’s why he wrote under a pseudonym. Although both books express doubts about believing in or relying on these practices, the books go into great detail about these subjects and thus create a sense that these are legitimate practices and beliefs. Milton ended the decade with another work of children’s non-fiction, I Wonder Why: The How, When and Wherefore of Many Things.9 I was very happy to see that he dedicated this book to his daughters, “Rosalind and Madeleine, whose many questions inspired the writing of this book.” At least this time he recognized that girls also have curiosity and a need to know about practical matters. 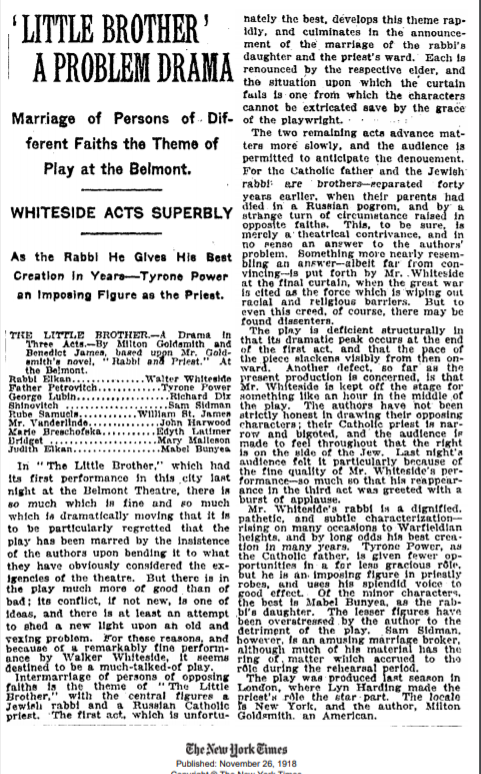 In addition to publishing all these books, Milton, along with Bennett James, adapted his first novel Rabbi and Priest into a play, The Little Brother, which was performed in London and then on Broadway in 1918 with a cast that included Tyrone Power, Sr. Despite positive reviews for its treatment of interfaith conflict and prejudices, it closed after 120 performances in March, 1919. What would the next decade and those to follow bring for my cousin Milton and his family? 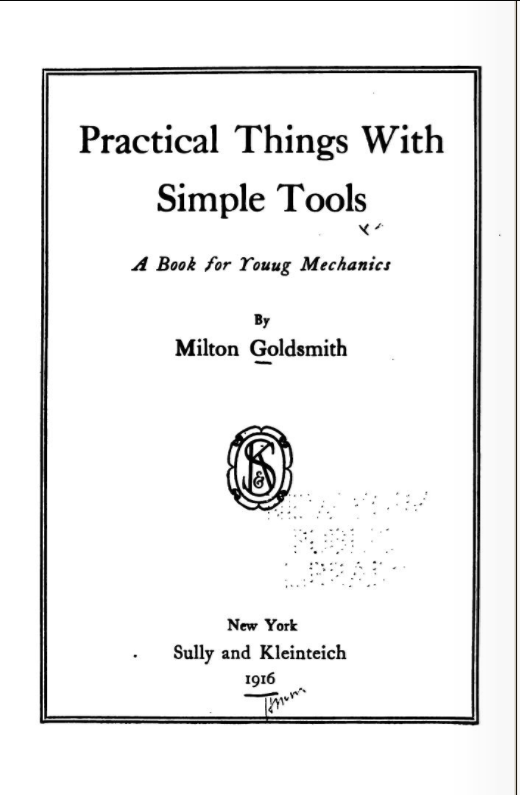 This entry was posted in Books, Genealogy, Goldschmidt/Goldsmith, New York and tagged books, children's literature, Goldsmith, Milton Goldsmith, New York City by Amy. Bookmark the permalink. 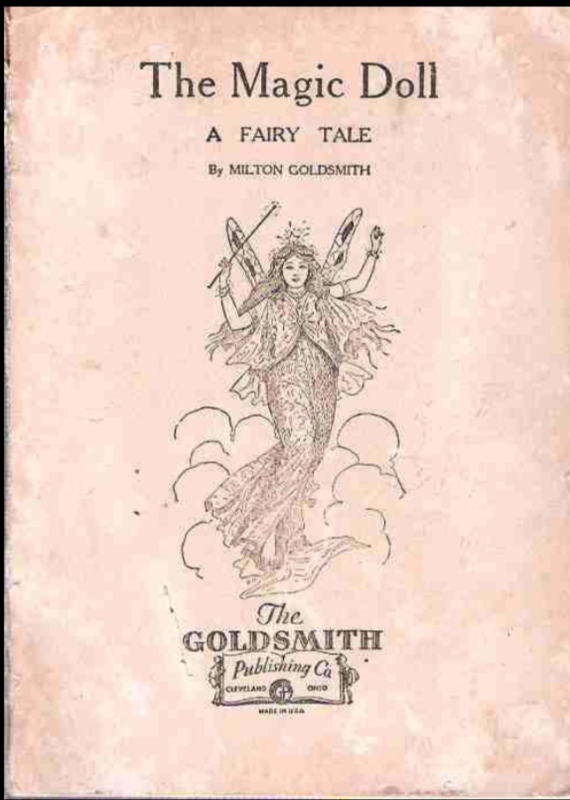 From all the things you write about Milton Goldsmith I can tell that he was a very successful writer, poet, playwright, and publisher. I found it interesting that he seemed to have dabbled a little bit with occult and found it necessary to write under a pseudonym. I guess he must have been concerned about his reputation. As always I admire your thoroughness in your blogging work, Amy. 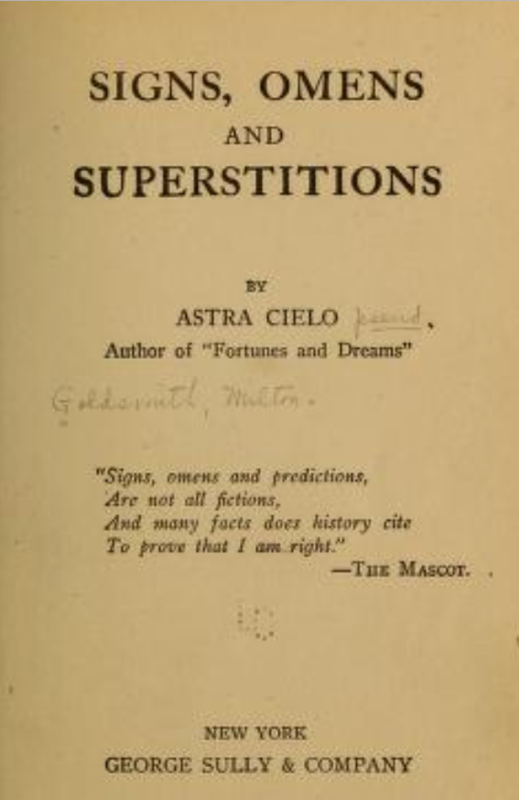 As you can likely tell from my post, I was quite bemused by the occult books—did someone ask him to write such books and he insisted to do it under a pseudonym? Or did he have an interest in it but was embarrassed so chose to write under a pseudonym? I wish I knew. Thanks, as always, Peter, for reading and for your kind words. Truly a great post on a very accomplished man. Sent you a message on FB on the “Walter and the Rabbits” book. By the way I got the Rabbi and Priest book I ordered. Will be sitting in the dentist waiting room this morning for 3 hours for a friend and excited to have the book to read! 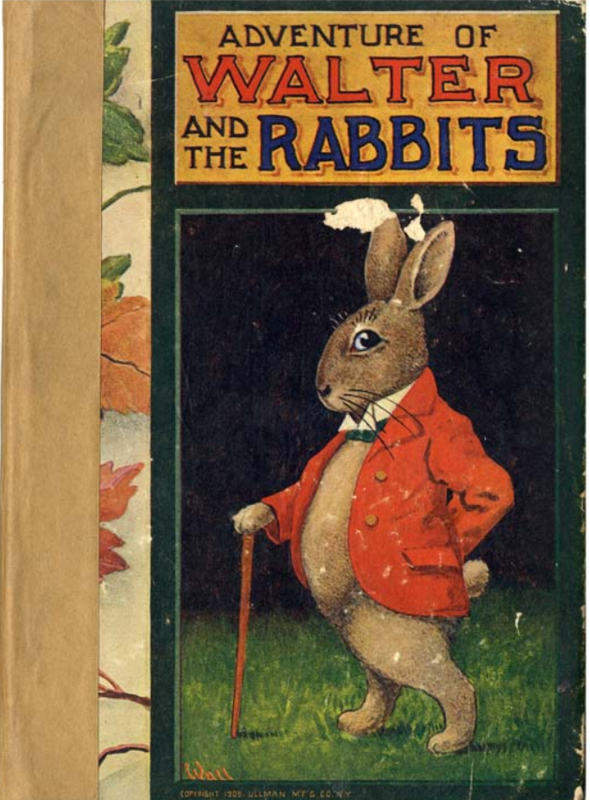 Thanks, Sharon—I just ordered Walter and the Rabbits plus another of Milton’s children’s books from Alibris. I figure if I start with a book or two or three, eventually I will have a full collection. Hope you enjoy Rabbi and Priest—three hours at the dentist?? Yikes! Amy, While I cannot delve into the topic in depth, I may be able to clue you in on some of the trends in popular culture after WWI that could have motivated Milton to write a book on divination and the occult. My late Mom wanted to write a collection of essays about the growing awareness in spirituality, the occult and mysticism that began to blossom and was cultivated as WWI progressed and after the war ended. There were various strands in this tapestry woven of mysticism, magick, occult and religion that ended once the 1920s set in and a spirit of resignation and disillusionment among young people took over. About the mid 1910s you had a growing interest in Theosophy. There was a Theosophical Society that my Mom mentioned often which hosted such authors as Geoffrey Hodson, author of “Fairies at Work and Play” which describes his visions of the spiritual entities at work assisting in the creation or destruction of the world we live in. Such lectures were well received by a small but serious group of intellectuals and people in society. There was also author Evelyn Underhill who wrote a book called “Practical Mysticism” in which she hoped to teach any reader the methods by which to sharpen their sensibilities and develop consciousness beyond the rational, intellectual levels. From what I got out of the book she wanted the reader to get in tune with their emotional faculties and intuitive capabilities. There was also a part of the spiritual and mystically focused communities that was aiming for social reforms the way Dorothy Day was. Since these trends all came together and the subject matter found a ready readership, Milton may have considered it lucrative to write the two works and see what the reception would be. Since he used a pseudonym it would not impact his serious works. I do not believe, though, given how receptive the public was that he would have been negatively received if he discussed the subject with other authors even without revealing he’d written such books. There were two little girls who claimed to have photographed fairies using a box camera. The works were clearly not authentic when we see enlarged reproductions of the photos today. But the subject matter so caught the public that the little girls received extensive media coverage. Even famous authors spoke out on their belief in fairies while others thought the whole thing was a sham. Emily, thank you so much for taking the time to share all this with me. I had no idea, and I’ve never heard of those others or theosophy. I had to Google it. Some of these things still exist today, of course—and some is considered pretty legitimate, like meditation. Almost every religion has some mysticism sect within it or is influenced by it. But astrology and omens and fairies seem quite different than finding spiritual ecstasy through prayer or meditation. Thank you again for your comment—it does help place all this in context. How did your mother get interested in the topic? You’re right, Amy about the differences. It just seems to have all come together in a blend for a few years. Even film stars like Rudoolph Valentino believed in spirit guides and what not. He wrote a book that included mentions of his Indian spiritual guides. Valentino’s first wife also was into this. I think WWI unsettled many people and they felt lost, helpless and powerless. That can be a reason why even astrology and omens were a trend for a while. My Mom practiced Buddhist meditation for 2 years. One thing led to another as she gained a sense of calm and control over her emotions. Mom was always interested in the course I took on comparative religions. She read whatever she could about Judaism, Christianity and Islam. She also got acquainted with the practices and religions that pre-date the Abrahamic religions. She believed that the cornerstones of western morality and society were built on the foundations Judaism and then the Christian teachings. In order to compare and attempt to understand what life may have been like before that she read up on mythology, folklore and the supernatural. I see what happened after WWI as just a little similar to what happened during the 1960s when our society was challenged and there was much upheaval. There was a looking to the East, mysticism and a longing to return to the earth based lifestyle. I think it was a reaction to the shock of what changes were happening. I think you are right—when our morals and values are challenged by war and other crises, we tend to look for comfort somewhere—religion, drugs, and mysticism. We all remember the Beatles meeting with the Maharishi in India. Fascinating stuff, Emily—thank you! Amy, what eclectic interests and a lively mind he had! Absolutely fascinating! I see an illustrators name. Did she illustrate all his books or was it different or even uncredited artists? 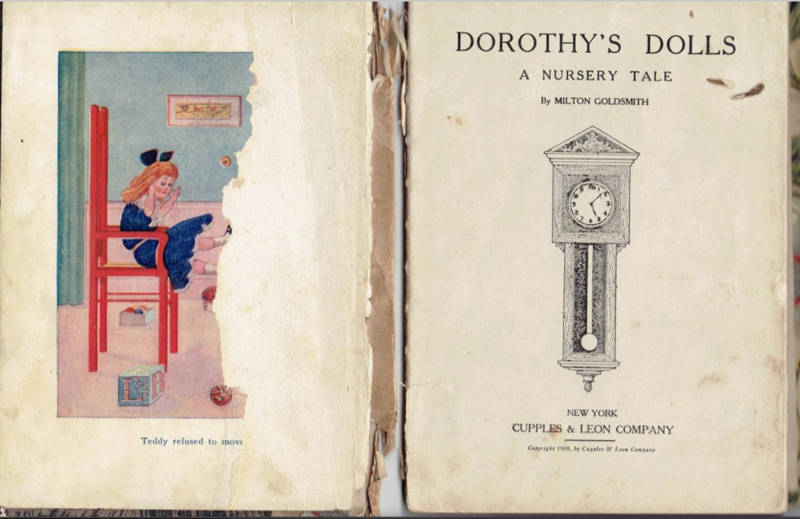 I know that his daughter Rosalind illustrated one of his later books (yet to be discussed), but I have not looked into the names of the illustrators other than the one right on the cover in the image on the blog. I will see if I can find the names. I don’t even have to go back to the image to remember the name Rose Superior. That sure sounds like a pseudonym! And from what I could see of the illustrations, they look pretty darn good! OK, I went back to double-check. Only one of the other books mentioned in this post had an illustrator named in the book—I Wonder Why—and the illustrator was Rose S. Berger. I wonder whether she was the same person as Rose S Superior, who illustrated Strange Adventures. But I can’t find any references on the other books to the illustrator. Strange. I guess the art work was not valued very much. Did he publish all the books through his company or were some published by other publishers? Usually children’s illustrators are quite valued. That makes me wonder if those two Roses are “related” to his daughter who has a similar name. I guess you would have to compare styles. No, it couldn’t be his daughter—she was still a child when those books were published. Most of the books were published by a different publishing company, not his own. It is odd that some have no reference to the illustrator, but maybe things were different back then? PS: All of what I have written was learned on our own. I make no claims to being 100% correct on the way we put it together since there was nobody who was interested in delving into the topics with us. Mom had plenty of books and discussions with me but once she began to exhibit the symptoms of Parkinsonism she could not read or type. How terrible. I am so sorry. She sounds like she was quite an interesting and intelligent woman. Thank you for your kind words, Amy. I didn’t mean to take the conversation so far off the topic of Milton. I have enjoyed this posting so much, especially since Milton wrote children’s books that were so beautifully illustrated. I just googled for images of “The Enchanted Dolll”. The search brought back several illustrations from the book that are so pretty. I’m motivated to seek out further illustrations and pages from his book when I have some time. You’ve done a great job pulling it all together and once again, I am so impressed with your family’s business smarts and adaptability. Your input is so valuable and very much related to the work of Milton, so please don’t apologize!! I really appreciate it. I treated myself yesterday to two of Milton’s children’s books; now I am going to follow your suggestion and google The Enchanted Doll. Thanks so much, Emily! Oh, thank you so much Amy! I would have loved to meet your cousin Milton and his family. I think my Dad would’ve enjoyed his business related conversations. Mom, of course, would have delighted in discussing his writing with him. If I had to choose a few ancestors to have dinner with, Milton would definitely be on my A list! Milton is just fascinating. I am so enjoying learning about his large and varied body of work. The fortune telling book really took me by surprise. Me, too! It’s been so much fun reading his work and writing about it. Milton must have been a very interesting man! I love how he incorporated aspects of his own family life in his work and particularly look forward to seeing his daughter’s illustrations in the future. A few of his books are currently available through abebooks.com for less than $5 each. I think I looked at that site, but will check again. Thanks, Katie! Hmmm. Why are my posts showing up? Is it something on my end or yours? I only read by email so never check the reader. I’m not sure. I mainly use the reader, and it seems that a few people randomly disappear and then reappear. I usually check back older posts when I’m reading to make sure I haven’t missed any — especially when it’s a on-going story. I’m so glad I did this morning. Milton is a fascinating character, and I’m enjoying the comments as well as the posts. I’m glad you did also. He’s one of my favorite cousins! Hi Amy. Edgar Cayce, the psychic, was very popular during the time Milton wrote his occult books. So I think he was picking up on a popular trend. I actually read the Walter and Rabbit book as a child. I think it was my mothers. So interesting. I think I would like to have known him. Wow, I can’t believe your mother had his book! I just received it today, and it was inscribed to someone (unknown) with the date 1908. I am so excited to own a copy. Thanks for the information about Edgar Cayce. The occult has never interested me so I was totally ignorant about this trend. I would definitely invite Milton to a dinner of my ten favorite relatives. When I was in high school I did an independent study on Edgar Cayce and the psychic movement. People were really into it, hence Harry Houdini’s quest to debunk it. Yes Milton would be a grea relative to be able to claim. I guess I’ve just always been too much of a skeptic!